While shade, protective clothing and a good dose of sunscreen are always paramount when it comes to preventing sunburn, there are certain foods we can eat to help increase our skin's natural sun protection factor (SPF). This is especially important as we head into summer and the festive season, as we're guaranteed to be spending time at the beach, in the backyard, and enjoying the great outdoors. The high omega-3 content in fish can boost our skin's immunity to sunlight by helping to maintain the skin's integrity and reducing inflammation. Omega-3 and zinc, which is also found in fish, help our bodies to naturally heal. Antioxidant-rich broccoli is a great source of sulforaphane, zinc, vitamin A and vitamin C. Broccoli also contains lutein, a carotenoid that protects our skin from oxidative damage and reduces the risk of skin becoming dry and wrinkled. Add some tomatoes to your summer salads; they're proven to boost our protection from the sun's UV rays. Tomatoes contain lycopene - an antioxidant that protects against oxidative damage. Studies have shown that people who eat more tomatoes have greater protection against UV exposure. Polyphenols found in green tea can reduce skin damage from UVA rays, which is the source of radiation responsible for skin ageing. Green tea can also maintain collagen in the skin, which is why we often see green tea extract listed as an ingredient in skincare products. 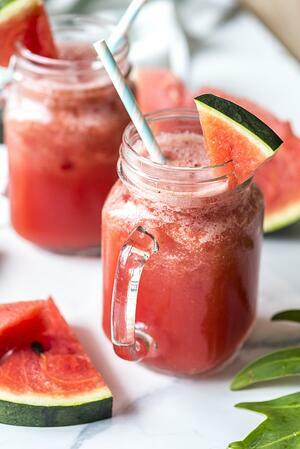 Watermelon is the perfect summertime snack! It contains even higher levels of lycopene (which absorbs UV radiation) than tomatoes. However, we would need to eat watermelon every day for 10 weeks before the lycopene will act as a natural protector against the sun. Carrots are high in betacarotene, which, after time spent in the sun, can inhibit our body's inflammatory response. Our bodies convert betacarotene into vitamin A, which helps support healthy skin and can shield us from sunburn. Unfortunately, no food is a substitute for sunscreen. There is no better protection against sunburn than limiting exposure to UV radiation. While a healthy diet rich with antioxidants can improve skin health, daily sunscreen application is the best defence against sunburn, skin cancer and sun damage.